Self storage is a rapidly growing industry that has yet to reach its full potential. As the country becomes more mobile than ever, mobile storage solutions have plenty of room for growth before they will reach market saturation. Indeed, when it comes to possibilities, the sky is truly the limit. To that end, the following are some industry secrets that aren’t so secret. IBIS estimates that the total revenue of self-storage businesses will exceed $30 billion per year by 2018. That figure is expected to climb to $33 billion by 2020. This means companies that strengthen their marketing efforts and expand their facilities now will be well positioned to capture a significant portion of this growth as it happens. Life is moving at a faster pace, and that means being able to move at a faster pace to keep up with it. Portable storage solutions entered the market as a novelty that consumers turned a skeptical eye towards. Today, that skeptical eye has been opened and consumers now view mobile storage as a time-saving, cost-effective moving solution. Yes, a prime location is still important for the success of a business. However, what’s more important is having the ability to ship mobile storage containers where consumers need them to be delivered. Thus, having an easily accessible location nearby a reliable transportation network is crucial for success within the mobile storage industry. The vast majority of self storage businesses aren’t run by corporations or large operators. 27,000 storage facilities in the United States are owned and operated by individuals who manage just one facility. A further 4,000 firms operate between two and nine facilities. That’s well more than half of the total of 54,000 self storage facilities in the country. These stats show that even the little guy can easily compete with the largest corporations that operate just 5,600 self storage facilities. It’s no secret that successful business begins with solid marketing. 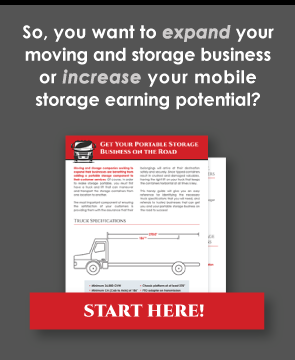 In the mobile storage business, this marketing includes marketing directly to consumers and to the real estate agents, property managers, lawyers, and other professionals that the general public uses. By building connections with professionals in these industries, you build a solid network of “word of mouth” advertising that greatly enhances the reach and penetration of your mobile self storage business. Starting a mobile storage business requires making investments in land, portable storage containers, trucks, and personnel. The facilities are easy to build, and the insurance and required registrations are straightforward. This means that it is not a difficult market to enter. The greatest obstacle is financing. However, self storage businesses are relatively well-insulated from the economy. Indeed, the industry has a risk-adjusted gain of 10.6%. This makes it easier to obtain financing from lenders who are eager to lend money to businesses they know will be able to repay the loans they request. The mobile storage industry is well positioned for exponential growth over the coming decade. Businesses that expand their portable storage options now will be at the forefront of changing consumer spending habits throughout this growth cycle. With low barriers to entry and solid growth predictions to build upon, the secret is out and now is the time to invest in an industry that continues to generate solid returns that you can take to the bank.